On Sunday, the 2015 November Nine returned to battle down to the final six in the World Series of Poker Main Event. The first day saw 72 hands play out, three eliminations take place, and plenty of chips added to Joe McKeehen's stack. Monday saw the final six return with the goal of cutting three more from the mix. When it was all said and done, 71 hands later, McKeehen again stood atop the mountain. He was joined by Neil Blumenfield and Josh Beckley. 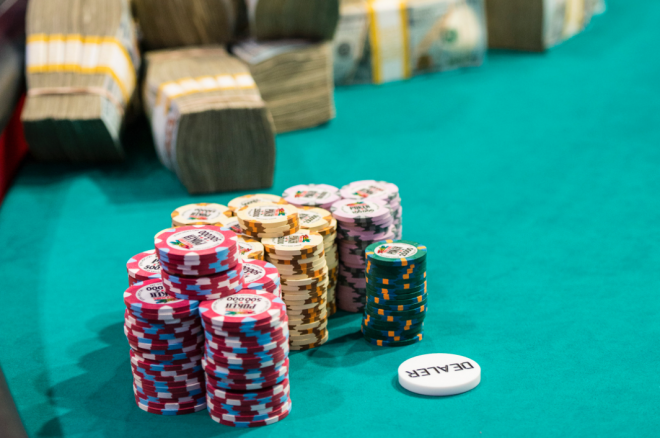 After reviewing the hands from the first day of play, it was revealed that the most active and aggressive players rose to the top. Much of the same occurred on Monday, with the numbers showing us that it pays to attack in poker rather than sit back and wait. McKeehen did just that, and his continued command over the rest of the field is as visible as its ever been. For the two that will join him on Tuesday, they also exhibited activity and aggression on Monday that helped them advance. With the help of the live updates posted on WSOP.com, let's take a look at the stats from the second day. Once again, McKeehen was by far the most active player, voluntarily putting money into the pot on 33 occasions, or over 46 percent of the time on Monday. This was more than he played on Sunday, where he voluntarily putting money into the pot on 28 of 72 occasions for nearly 39 percent activity. The increase wasn't unexpected, though, so don't be surprised. The change lines up thanks to the combination of short-handed poker and McKeehen's increased dominance of the table. Although McKeehen played a highly-active style with lots of aggression, his first three-bet didn't come until Hand #104, or the 32nd hand of Monday. Most people were pleasantly surprised to see how much Blumenfield opened up his game on Sunday, as many expected a snug form of poker from the 61-year-old player. Instead, he came out firing from the start, three-betting on Hands #3-5 and raising on the Hand #6. On Monday, it appeared he was going with the same game plan. The first two hands that Blumenfield played on Monday were both with him three-betting. He was also the first player to stick in a four-bet on the second day of action. Max Steinberg also came in starting the same way he did the day before. On Sunday, Steinberg was the first to get aggressive and raised on the first hand. On Sunday, he did the same thing and raised on the first hand. Knowing how active Blumenfield played on Sunday and his quick continuation of this style on Monday, it's a bit surprising his opponents didn't take more opportunities to play back at him. In particular, there was one hand shown on the ESPN broadcast where Steinberg raised on the button with and Blumenfield three-bet from the big blind with . Steinberg opted to fold. Another similarity to Sunday was that an elimination occurred on the second hand of the day, with Thomas Cannuli's aces getting cracked by Steinberg to bust in sixth place. Including all-in pots, there were nine showdowns on Monday, down one from Sunday's 10. Two of those resulted in chopped pots, and, including all-in pots, only Ofer Zvi Stern and Cannuli failed to win at showdown. McKeehen, Blumenfield, and Steinberg won two showdowns, and Backley won one. Of the 71 hands dealt on Monday, four of those were all-in preflop showdowns and 45 of the other 67 were hands that didn't make it to a flop. Of those 45 hands that didn't see a flop, 30 were won with a single preflop raise. Now, combining the numbers from Sunday and Monday, let's see what we've got. As you can see from the overall numbers, McKeehen, Blumenfield, and Beckley have been the most active and aggressive players, and now those three comprise the final three in the event. This is not by coincidence. Aggressive and staying active pay in poker, and right now it's paying these three players at least $3.4 million. After Sunday, McKeehen had the biggest increase in his stack, upping it by almost 45 percent from 63.1 million to 91.35 million. The next biggest positive move was Blumenfield, who increased by over 43 percent. Let's see how everyone did on Monday. Once again, McKeehen saw an increase of more than 40 percent to his stack. Blumenfield also saw a solid jump of over 27 percent, but it was Beckley who added the most compared to what he started with and added nearly 118 percent. The only problem here is that Beckley started pretty short, so his end result still has him last in chips heading into Tuesday's final day. It's also worth noting that heading into the second day, McKeehen had 2.81 times Stern's second-place stack. Heading into the third day, McKeehen increased that. His stack of 128.825 million is 3.21 times that of Blumenfield's 40.125. The collapse of Stern was the most telling here, as he was from 32.5 million to start the day to out in fifth place. Stern took a severe hit when he shoved blind versus blind against Beckley with the . Beckley woke up with two aces in the big blind and doubled up. Stern could never find his footing after that. Knowing how aggressive and active Blumenfield has played so far, it's going to be interesting to see if he continues the same at the start of Tuesday's final three or sits back a little bit hoping that McKeehen will dismantle Beckley. He's surprised us so far with his willingness to up the aggression at the table, but that lends itself to another interesting question. Could we see a Joseph Cheong-like blow up from Blumenfield against McKeehen? He has the direct position on McKeehen, and Blumenfield certainly hasn't shown that he likes to back down. If a spot comes up where McKeehen has a big hand, but Blumenfield thinks he is just pushing him around, things could get really fascinating. It could end up gifting Beckley a spot in heads-up play, but we'll have to wait until 6 p.m PT today to find out.